Friday 3rd November will be our final Friday Showcase for 2017. It’s always a fun conclusion for our year, with all members invited to bring along a finished quilt or work in progress to “Show and Tell”. Prepare for animated discussion, a sharing of ideas and one of Elaine’s brownies with a coffee or tea. Or take the opportunity to borrow from our extensive library whilst there! We look forward to your company and the pleasure of viewing the variety of projects and techniques our members continue to delight and encourage each other to try. Hoping to see you at 10am at our usual venue, our city office at 278 Pitt Street, Sydney. Members and guests welcome. Friday Showcase will resume in February 2018, with a presentation by Kaye Murray. At yesterday's annual general meeting of QuiltNSW, the prize winners of this year's Suitcase Challenge competition were announced. Addressing the theme "Remember", 45 entries were received. All entries can be viewed on our website and will, over the next two years, travel across NSW, SA and Tasmania as a travelling exhibition. In 1st place, winning a one-of-kind BERNINA 215 sewing machine to be customised with artwork from her winning quilt, Linda Butcher with "For Valour". In 2nd place, Sheila Beer with "In a Fog"
In 3rd place, Julie Harding with "Forget-me-not"
Julie Harding with "Monday Wash Day"
Louise Stuart with "The Camera"
All entries, with their quilt stories, can be viewed on our website. Congratulations to our prize winners and thank you to all the members who participated in the competition. Without your entries, we would not have the Suitcase Challenge exhibition that the entries become. Thank you to BERNINA Australia for coming on board as our first prize sponsor. At our AGM, we also announced that the theme for 2018 is "Running Away with the Amish". Look out for the November Template, our quarterly newsletter to members, for more details and a full wrap of our AGM. We look forward to more members getting involved in 2018. An initiative of the Australian Design Centre, Sydney Craft Week is a celebration of Sydney's makers, and it is fitting that we have not one but three QuiltNSW events that coincide with this inaugural event. First up, is our regular Friday Showcase on Friday 6 October with Grace Widders. Grace ventured into our craft as a self taught quilter, beginning with a wall hanging kit, then a Mariner’s Compass. 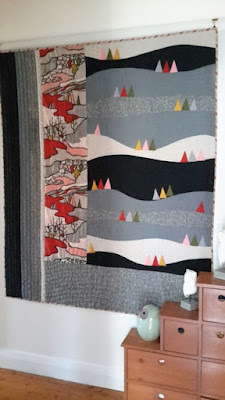 Joining Hunters Hill Quilters in 2000 opened new opportunities to Grace, inspired by the variety of talented group members to work with wool in Waggas, produce community quilts, join workshops, take up several committee positions and move into teaching machine quilting. 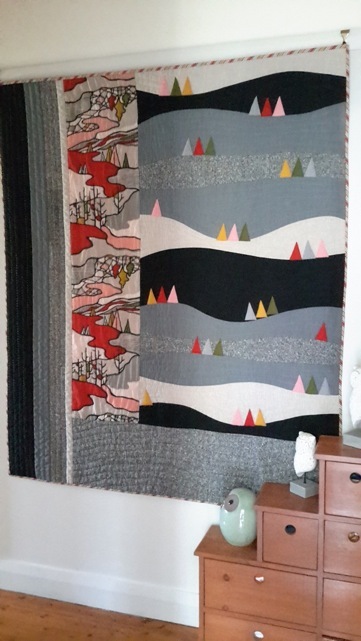 Her work has been displayed and has won awards in several quilting shows, including at the Sydney Quilt Show and the Modern Quilt Show Australia. Grace’s current quilt designs grow from fabric that 'talks to her’, enjoying the texture that wool and linen offer. 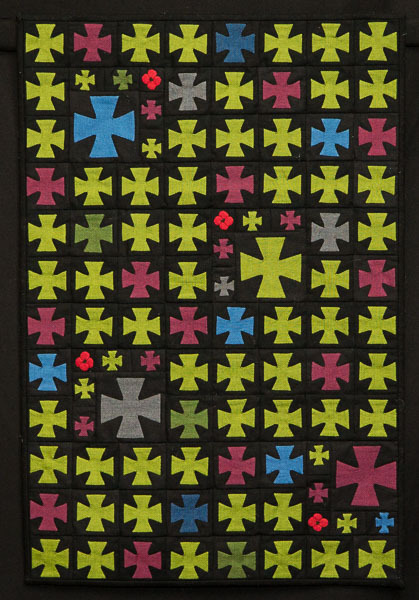 Grace continues to teach at Material Obsession and whilst she machine quilts for others, still loves the process and appearance of hand quilting her own quilts. 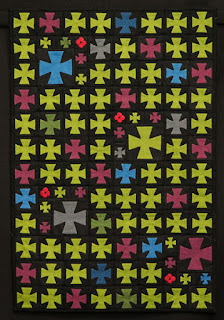 You may have admired Grace's beautiful hand quilting in this year's Raffle Quilt at the Sydney Quilt Show. Friday Showcase is on Friday 6 October with the presentation starting at 10am. Visitors are most welcome so bring a friend along - $5 for members and $10 for visitors. Greg Alexander, managing director of BERNINA Australia, and Heather Middleton, outgoing Suitcase Challenge coordinator, will announce the winners of our annual travelling Suitcase Challenge competition from the 45 entries received (shortly after 1 pm). All entries will be on display all day with viewer's choice voting closing at 12 noon. There will be afternoon tea at the conclusion of the AGM (around 2.45 pm) - free to members with a small charge for visitors. We are participating in Craft Up Late on Wednesday 11 October by opening our office from 5 - 8 pm. Grace Widders will be there to talk about her quilts that will be hanging in the office; Jessica Wheelahan will have the entries from the 2017 Suitcase Challenge competition and some Committee members will be present to talk about what we do and how visitors can get involved with QuiltNSW. If you know a quilter who works in or lives close by the city, please suggest that they drop in and see us on Wednesday 11 October. Visitors are most welcome. Beyond our events, the Australian Design Centre has gathered over 100 events in a comprehensive program that can be picked up from their gallery space or at one of the participants. We have a limited number of programs if you'd like to collect one from our office. Alternatively, the full program and more information can be accessed online.